On July 23, 1928, the 25th Oswald the Lucky Rabbit short film Sleigh Bells was released to theaters. Originally considered a lost film, it was discovered by the British Film Institute (BFI) in their collection in 2015. The collection had been uploaded to an online database, where a Disney researcher spotted the film. Before being spotted, the film reel was earmarked to be thrown away, but BFI’s upload ultimately saved the film. The film premiered for the public on December 12, 2015, almost 90 years after its premiere. Posted in Uncategorized and tagged 1920s, Black and white, Oswald the Lucky Rabbit, Restoration, Short film. Bookmark the permalink. On May 7, 1999, a special restored version of the ground-breaking live-action feature 20,000 Leagues Under the Sea was shown for a limited engagement at the El Capitan Theatre. The film on its first showing was accompanied by director Richard Fleischer, matte artist Peter Ellenshaw, and Disney historian Scott MacQueen, who talked about the film in detail and introduced the movie to audiences. The limited engagement ran until May 13, with shows scheduled daily at noon, 3pm, 6pm, and 9pm. Posted in Uncategorized and tagged 1990s, Color, Feature Film, Live Action, Restoration. Bookmark the permalink. On November 29, 1926, the Alice Comedy Alice’s Spanish Guitar was released to theaters. It starred Margie Gay as Alice, and was the 38th Alice Comedy produced. Originally considered a lost Alice short, a rare nitrate stock copy of it was found in 1998, and was subsequently restored. It was then shown at the Pordenone Silent Film Festival in Italy. In the short, Alice is a guitar-playing senorita, who is captured by villain Pete and rescued by her faithful sidekick, Julius. Posted in Uncategorized and tagged 1920s, Alice Comedy, Black and white, Restoration, Short film. Bookmark the permalink. 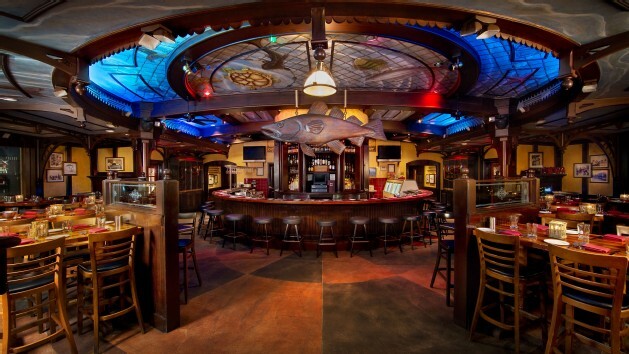 On March 10, 1996, the Fulton Crab House restaurant opened in Walt Disney World’s Pleasure Island part of Downtown Disney. The restaurant was built on the former Empress Lilly riverboat, which was a moored riverboat that featured three restaurants and was considered the most elegant dining experience in the park. Fulton’s features a decadent seafood menus, as well as the choicest cuts of beef; the restaurant is also an 11-time winner of the Wine Spectator Award of Excellence, with their wine cellar holding over 2,000 bottles. Posted in Uncategorized and tagged 1990s, Disney Park, restaurant, Restoration. Bookmark the permalink. On February 2, 1994, The Walt Disney Company announced their $29 million plan to restore the historic New Amsterdam Theater on 42nd Street, New York City. Disney’s plan included restoring the theater to its original splendor and Art Nouveau style architecture, and using it as a permanent home for new theatrical productions. Currently, it is showing Mary Poppins. The theater was built in 1903, and from 1913 to 1927 was home to the famous Ziegfeld Follies, which showcased such talents as Fanny Brice and Olive Thomas. In 1936, the theater was closed due to the economic downturn of the Great Depression and the effect it had on the theater industry, but the theater opened soon after as a movie theater. In 1982, it was purchased by the Nederlander Organization, but in 1990, the State and City of New York won ownership of the theater. Disney negotiated with state and city agencies, contributing $8 million to the restoration, with the remaining amount loaned to the company from the 42nd Street Development Project. “New York City wanted to bring Disney’s wholesome image to its sleaziest playground,” Julie Andrews narrates on the documentary Broadway: The American Musical. “But Disney wanted assurance from Mayor Rudolph Guliani that the neighborhood would be safe for families,” as the 42nd Street neighborhood at the time comprised many adult entertainment centers. 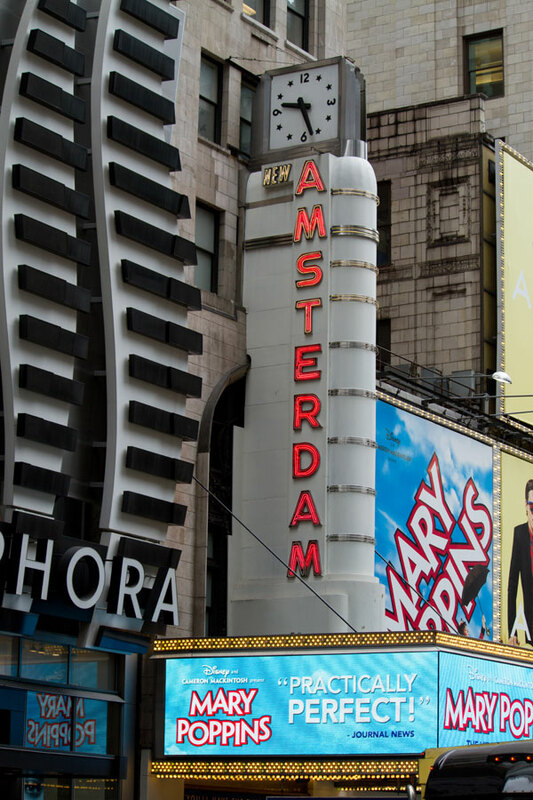 Disney’s acquisition of the theater helped bring new life to 42nd Street and Broadway, and brought a new venue of interest to major corporations. In the fall of 1997, Disney’s first musical, The Lion King, opened in the newly refurbished theater. Posted in Uncategorized and tagged 1990s, Acquisition, Broadway, Restoration. Bookmark the permalink.